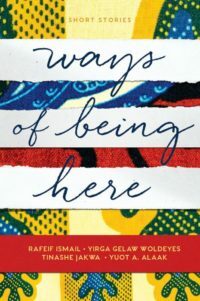 Ways of Being Here is a collection of stories by African-Australian writers showcasing a diaspora that receives little attention in contemporary Australian writing. The four writers, Rafeif Ismail, Yirga Gelaw Woldeyes, Tinashe Jakwa, and Yuot Alaak, trace their lineage to Sudan, Ethiopia, Zimbabwe, and South Sudan, respectively, and it is their strong connection to their homelands, culture and memories that drive their own individual stories. Easy to read, the novellas provide readers with unique voices and experiences usually hidden in the Australian literary landscape. The stories themselves were exposed through the Ways of Being Here flash fiction competition set up by the Centre for Stories in Western Australia, which seeks to share the work of diverse storytellers, poets, and other creative people in order to strengthen the connections within the community. Inclusivity within communities is definitely a theme running through all the stories, each highlighting the issue of acceptance in their own poignant way. In Yirga Gelaw Woldeyes, ‘When the Sky Looks like a Donkey’, it is shown how cultural and linguistic explanations can conflict with the social expectations placed on new Australians. Through the eyes of Ermi, a security guard in training who is trying to navigate workplace conversations and expectations, the reader sees how Ermi’s formal migrant English challenges the often lazy Australian drawl. Yuot Alaak’s story ‘The Lost Girl of Pajomba’, about the terrifying separation of mother and child during war, highlights the importance of humanitarian and human rights effort with the powerful statement “I can only wish Mum and Dad were alive to witness the kindness of the human spirit. That my brothers survived to experience the innocence of childhood.” Whilst the shortest of the four stories at only eight pages, Alaak’s strong and sharp prose captures the reader immediately and is a fitting finale to the collection of stories that makes up Ways of Being Here.